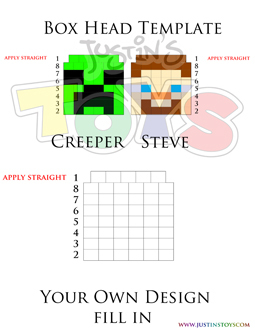 This design was created by Rob and shows you how you can personalize a square box head and make characters such as Minecraft Creepers, Steve and even your own custom characters. It takes one loom and 54 bands (47 for the face and 7 connector bands to hold the face together). This can be extended to make a 6 row name bracelet as well.